Mavic's last hurrah in the complete gruppo market came in the early 00's. Mektronik, introduced in 1999, seems to have cowed Mavic enough that I can't imagine we'll ever see them market a complete group again. Expensive, quirky, and downright troublesome, Mavic was looking just a little too far ahead when they pushed their even more futuristic replacement for the Zap to market. As Shimano and Campagnolo have demonstrated, today the world is ready for electronic shifting. 10 years ago, not so much. But a gruppo isn't a gruppo without a full array of components. Mektronic provided the integrated brake levers and electronic rear derailleur. Lesser known, but also present was the Mektronic front derailleur - a mechanical derailleur, a pretty significant departure from their 810/860 design to work with the narrower 9 speed drivetrains that were popular at the time. Mavic also introduced their leaf-spring R3 brake at the same time. All were available, for a price, with the brakes still available up until the last couple of years. But what about a crank and headset? Mavic clearly had plans to offer Mektronic as a complete group. And to do that, they would need a crank/bottom bracket, and a headset. Their 2000 catalog showed just such items. The headset, a threaded model, would be de rigueur, with 1" threadless headsets appearing on most high end frames right around that time. The crank looks to be ISIS. It looks familiar, but I can't put my finger on what other vendor's crank it looks like. My guess? It's an FSA crank, or one of the closely related companies in Taiwan, who was probably also the source for the brake calipers and front derailleur. Regardless of who was going to make the crank, it seems that it never happened - or if it did, it certainly never happened in quantity. 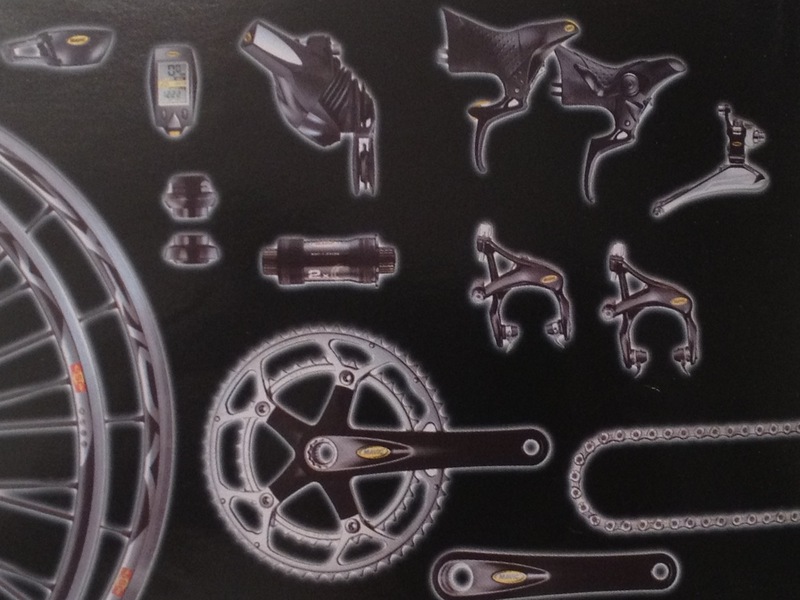 I've never seen the crank (and associated bottom bracket) or headset, other than in the catalog. Everything else was produced, though certainly not in the quantity of earlier Mavic components. If you have a crank or headset, please send me pictures! Huge thanks to John Liu for providing me the images from the 2000 Mektronic catalog! Have a 92 lemond carbon for sale and need to ask you some questions but can't find your email address. That crank looks a lot like a Ritchey I had back then. Not sure who made it though. The indent is much longer than what is seen in the Mavic picture. I have decided to go with the latter - it has the spider carbon wrapped so slightly different but I happened to have a pair lying around. Hi just came across this post and being a Mavic fan too, couldn't help getting sucked right in. 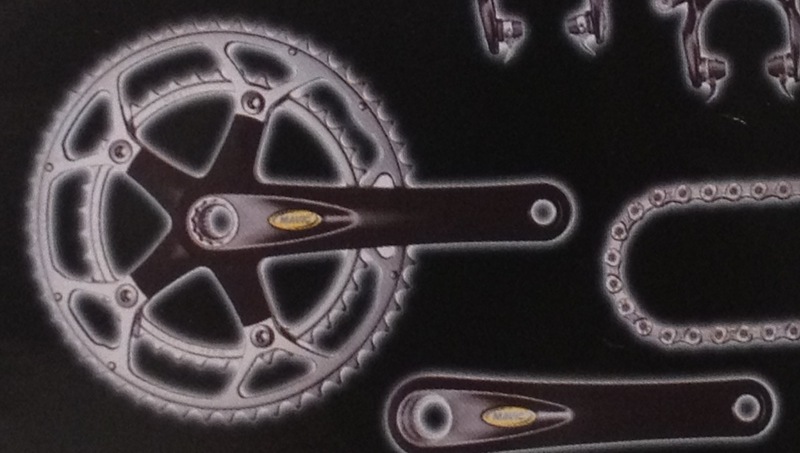 I did come across a carbon crankset of the design your pic shows on ebay some years ago (around '03/04 if memory serves me correct) and though I was very interested the seller wanted alot for them as he rightly said they were uber rare and one of only 2 he knew in existence. I think the price was somewhere over $500 maybe even more I can't quite remember. I do however remember the seller saying the manufacturer was Stronglight and showing a pic of a very similar looking set bearing the Stronglight logo. Obviously I have googled it since but found nothing. The front mechs have cope up frequently on ebay over the past 10 years (and some went for really low money) and in hindsight I should have picked one or 2 up. Can't add anything to the headset conversation though in team bike pics of the era they used the 305 which is the best headset in the world IMO. I have one of the Mavic Mektronic chainsets, and b/b, it is a unique design not ISIS or otherwise seen since, I had three infact sourced by eBay around 2004-05, I kept the one and a spare pair of 53/39 Zicral chainrings, the chainset is built to a Greg Lemond Ti I have with full Mektronic group and ITM Millenium finishing kit with ITM Millenium CNC Aheadset. It is smart and rides well. The front mech is a Sachs Rival. Funny - I was just about to tell the post about your chainsets.